From Shrek franchise veterans Mike Mitchell (Shrek Forever After) and Walt Dohrn (Shrek 2, Shrek the Third), TROLLS features the voice talents of Golden Globe® nominee Anna Kendrick (Pitch Perfect, The Accountant), Grammy and Emmy® Award winner and Golden Globe® Award nominee Justin Timberlake (Friends with Benefits, Shrek the Third), Golden Globe® and Emmy® Award nominee Zooey Deschanel (“New Girl”), Christopher Mintz-Plasse (Superbad, How to Train Your Dragon), Golden Globe® and Emmy® Award winner Christine Baranski (“The Good Wife,” How the Grinch Stole Christmas), Russell Brand (Get Him to the Greek, Forgetting Sarah Marshall), Grammy Award nominee Gwen Stefani (“The Voice”), Golden Globe® and Emmy® Award nominee John Cleese (Shrek 2, Shrek the Third, Shrek Forever After), Emmy® Award winner James Corden (“The Late Late Show with James Corden”, Into the Woods), Golden Globe® and Emmy® Award winner Jeffrey Tambor (Transparent, “Arrested Development”) and Ron Funches (“Undateable,” Get Hard). “The movie’s message, and it’s a lovely one, is that we all have a wild-haired, beaming doll of happiness inside. 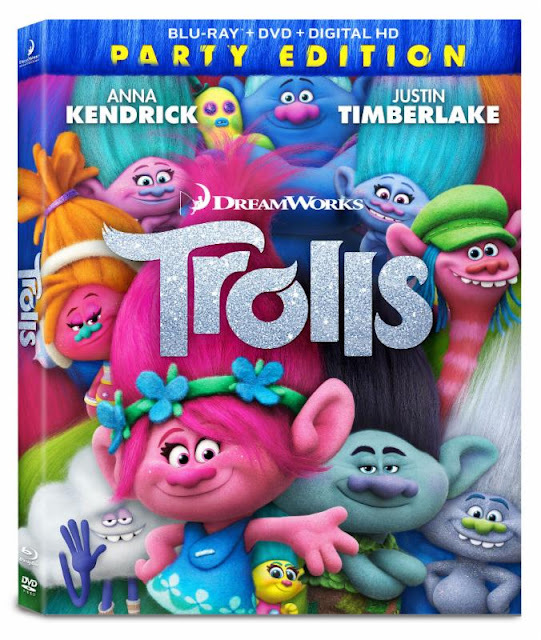 ‘Trolls’ will put you in touch with yours,” proclaims Owen Gleiberman of Variety. (BRING HOME HAPPY WITH DREAMWORKS TROLLS ON DIGITAL HD JAN. 24 AND BLU-RAY™ & DVD FEB. 7) This is one movie that I really want to watch with our grandson the next time he comes to visit me.